It’s April 1st! And, yesterday the Legislature crammed down the minimum wage increase with minimal public input (see MOORLACH UPDATE — $15 Minimum Wage — March 29, 2016 march 29, 2016 john moorlach). Even the LA Times opined against rushing this decision in its lead editorial in yesterday’s edition (see http://www.latimes.com/opinion/editorials/la-ed-0331-minimum-wage-20160331-story.html). In classic parliamentary fashion, the Democrats shaped the agenda and stuck together (with maybe two or three exceptions) and obeyed the orders dictated by the public employee unions and commandeered Thursday’s Floor Sessions to cram down this monumental legislation. This will be an inflection point in California’s history. California already has a teetering balance sheet, one where liabilities dramatically exceed assets. It has ever rising pension plan contributions on the horizon. It has deferred road maintenance, due to increasing pension plan payments and a lack of priority by the ruling party. It has a school bond measure on the November ballot that will impact the General Fund with $500 million per year in principal and interest payments. It now has an upcoming $4 billion additional cost for labor, due to a 50 percent increase in the minimum wage. California is heading toward a fiscal cliff at a rapid pace and it now wants employers to provide pension plans for those they hire with SB 1234, which I mentioned in my Floor speech (see http://district37.cssrc.us/content/sen-moorlach-comments-passage-minimum-wage-bill). This will be another onerous obligation on our job producers. And another incentive to join the underground economy, further eroding our honest business community participants. In the next few months, the Legislature will try to increase the tobacco tax (a product that mostly low income individuals purchase in much higher numbers than other economic sectors). Then, it will try to raise the gas tax because it failed to make fixing roads and streamlining its Department of Transportation a priority. California is already seeing a net migration out of the state. And, its school enrollment is declining for the first time since World War II. There are subtle signs telling us that California is not the economic paradise that our young people are looking for. And, economics, the basic need to earn a living, is the biggest driver for individuals to select a place to live, work and recreate. Increasing the minimum wage will increase costs. For labor intensive businesses, it could be a 20 percent increase. So, how are seniors on fixed incomes supposed to deal with this? They haven’t seen serious increases in Social Security benefits for some five years. And, after costs rise for every day items, the minimum wage increase will be spent on just surviving, with additional disposable income being minimal. Gov. Brown has done a reasonable job of trying to put a tourniquet on California’s fiscal bleeding. He also has raised a significant amount of unused campaign contributions that he could have expended in defeating the ballot measure that just qualified. That would have been the appropriate thing to do. Once he signs this bill on Monday, he will leave California in worse financial shape than how he found it. That’s my fiscal prediction, and I’ve been accurate on two prior major municipal fiscal predictions, the OC Bankruptcy and SB 400’s "3% at 50," during my lifetime. Below we have the Associated Press piece on the topic, with photo, followed by The Sacramento Bee and the OC Register. The fourth piece is from KPFK 1530 AM, and you can hear me in my quiet voice on the side of the Senate Chambers at http://kfbk.iheart.com/articles/kfbk-news-461777/minimum-wage-bill-passes-through-ca-14554495/. The fifth piece, fromAbruzzo TV, gives me an incorrect quote. Consequently, I’m only providing the paragraph and this is my correction notification. The sixth piece is in Fox & Hounds and provides details from our press release pointing out the irony that the Department of Finance, the Governor, and the Legislative Analyst’s Office all publicly lamented the proposition of a minimum wage increase. The final piece deals with SB 1234, which I mentioned above and in my Floor remarks. Stay tuned. It is from The American Spectator. It also covers the minimum wage discussion and SB 400. To the hard working business owners in my District, I want to assure you that this is not an April Fool’s Day joke. Meanwhile, in New York, Gov. Andrew Cuomo reached a tentative deal with top legislators late Thursday to also raise his state’s minimum wage to $15 an hour. If the tentative pact holds together, New York would become the second state to pay its workers that much. The income divide has become a key issue across the U.S., with President Barack Obama proposing an increase to the federal minimum wage and the issue getting attention in the Democratic presidential primary. Brown, also a Democrat, said it proves that California can get things done and help people get ahead. The Assembly passed SB 3 with a 48-26 vote. The Senate followed, 26-12. California’s current $10 an hour minimum wage is tied with Massachusetts for the highest among states. Only Washington, D.C., at $10.50 per hour is higher. Los Angeles, Seattle and other cities have recently approved $15 minimum wages, while Oregon officials plan to increase the minimum to $14.75 an hour in cities and $12.50 in rural areas by 2022. The tentative deal reached by New York officials Thursday would be phased in regionally, eventually affecting more than 2 million workers. In New York City, the wage would increase from $9 to $15 by the end of 2018, though businesses with fewer than 10 employees would get an extra year. In the New York City suburbs of Long Island and Westchester County, the wage would rise to $15 by the end of 2022. The increases are even more drawn out upstate, where the wage would hit $12.50 in 2021 and then increase to $15 based on an undetermined schedule. Brown was previously reluctant to raise the base wage. He negotiated the deal with labor unions to head off competing labor-backed November ballot initiatives that would have imposed swifter increases without some of the safeguards included in the legislation. Brown now says the most populous state’s fast-growing economy can absorb the raises without the problems predicted by opponents. Art Pulaski, executive secretary-treasurer of the California Labor Federation, hailed what he called a historic day for California and the country. "California takes a massive leap forward today in the fight to rebalance our nation’s economy," Pulaski said in a statement. However, Allan Zaremberg, president of the California Chamber of Commerce, said the increase was being made too fast. "It is unfortunate the Legislature didn’t take advantage of the opportunity to address the issue in a more balanced manner," he said. Some members of the Legislature cited the nation’s imbalance in wealth while voting in favor of the wage increase. "While we have made great strides in recovering from the economic recession, we know the bulk of that growth has been to the benefit of the top 1 or 2 percent," said Assemblyman Roger Hernandez, D-West Covina. "Too many workers are working full-time for poverty wages." State Sen. Isadore Hall, D-Compton, said many workers are struggling to cover living expenses. "They’re trying to figure out a way to buy their children diapers," he said. "They’re finding out a way to buy their children milk. Or how might they be able to pay their utility bills." Assemblyman Jim Patterson, R-Fresno, countered that such a drastic increase would force small business owners to make layoffs "with tears in their eyes," ultimately resulting in less employment. "Business owners are going to go, is this an April Fool’s joke?" Sen. John Moorlach, R-Costa Mesa, added. After the Assembly and Senate votes, dozens of supporters gathered on the lawn outside the Capitol for a labor-organized rally. Many waved signs saying "$15 California." Krystine Wilson, 27, of Carmichael said the higher wage will help her avoid racking up late fees and payday loans when the $10 an hour she earns at a fast-food restaurant isn’t enough. "We have to decide whether or not we want to pay a certain utility bill, or do we want to pay the rent?" Wilson said. "We have to make that decision every month." This story has been corrected to show that State Sen. Isadore Hall is a man. California lawmakers moved swiftly Thursday to ratify a deal boosting the state minimum wage to $15, sending legislation to Gov. Jerry Brown just days after the governor announced a deal with labor leaders. With his planned signature in Los Angeles on Monday, Brown will avert a costly ballot fight, give California the nation’s highest wage and make it the first state to vindicate organized labor’s national "Fight for 15" rallying cry. Labor officials were triumphant. Wage hikes would occur annually, beginning with a boost to $10.50 in 2017 for businesses with 26 or more employees, $11 in 2018 and another dollar each year thereafter. After the wage hits $15 it could continue to rise with inflation. Smaller businesses would have an additional year to implement each annual bump. The bill would also provide in-home health aides three annual sick days. According to the Department of Finance, a $15 wage would cost California about $4 billion a year. Brown had warned a $15-an-hour wage must be done carefully, noting costs to employers and the state. But with a measure heading for the November ballot, he negotiated with unions and other advocates to include provisions that allow governors to postpone an increase if the economy falters. Those provisions would allow governors to suspend annual wage increases short of $15 if officials project that the state’s budget reserves will be in the red, or if employment and sales tax revenue decline. Governors would need to decide each September whether to suspend increases coming the following January. In the first significant test for new Assembly Speaker Anthony Rendon, D-Paramount, Senate Bill 3 passed the Assembly floor on a 48-26 mostly party-line vote Thursday. Two Democrats voted no – Assemblymen Adam Gray of Merced and Tom Daly of Anaheim – and Assemblyman Rudy Salas, D-Bakersfield, withheld his vote. The Senate approved the measure 26-12, following a similar pattern: Not a single Republican supported the bill in either house. Onlookers in the gallery erupted in cheers and shouts of “Si Se Puede!” after both votes, highlighting the vote falling on Cesar Chavez Day. Democratic backers called the bill a lifeline to workers struggling to survive on the current $10-an-hour minimum wage. It drew support in the Assembly from both liberals and business-friendly moderate Democrats. “Stagnant wages have hindered economic growth and relegated too many Californians to a life of poverty, especially in the Inland Empire,” said Assemblywoman Cheryl Brown, D-San Bernardino, a moderate facing an election challenge from the left. At times shaking their heads and scoffing at the comments in opposition, Senate Democrats repeated that an increase of the minimum wage will make life easier for the state’s lowest income families and lift them out of poverty. “There are people out there working 40 hours a week, doing back-breaking work, and still not earning enough to support their families,” said Sen. Hannah-Beth Jackson, D-Santa Barbara. Republicans argued the bill would backfire, hurting the people it is intended to help by leading employers to cut entry-level jobs and raise prices. They warned an inflated cost of living would impoverish senior citizens living on fixed incomes. Those arguments amplified criticism from business groups who have assailed the $15 rate. They call it an untested overreach that will worsen a business climate already burdened by heavy regulation and a recently implemented $10 wage that is among the country’s highest. California Chamber of Commerce president Allan Zaremberg called it “too much, too fast” in a statement. 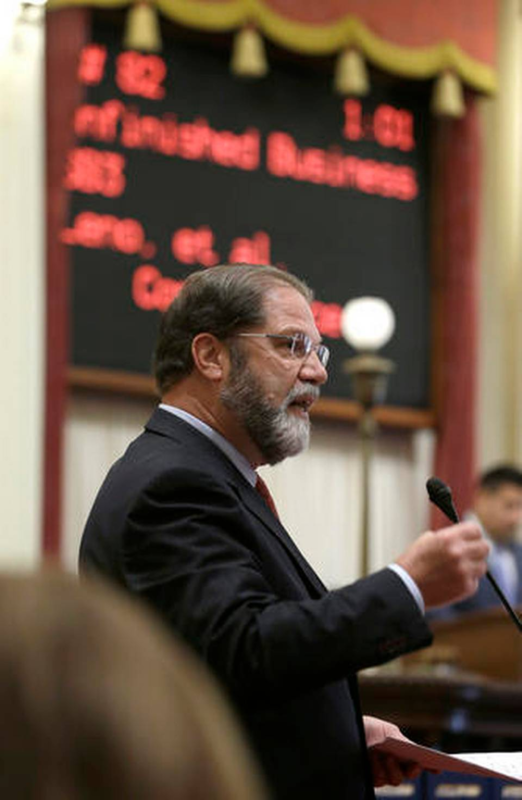 “Once taxpayers wake up and see newspaper headlines tomorrow morning, business owners are going to think it’s an April Fools joke,” said Sen. John Moorlach, R-Costa Mesa. Assemblyman David Hadley, R-Manhattan Beach, said it would inflict pain on economically beleaguered areas of California, criticizing lawmakers “who live in high-wage, affluent parts of coastal California, who are prepared to throw an entire region of this state under the bus.” He accused supporters of rushing needlessly. Countering that point, Democratic backers argued policymakers have had years to mull a higher wage amid a concerted campaign to raise it. Jeremy B. White: 916-326-5543, @CapitolAlert Jim Miller of The Bee Capitol Bureau contributed to this report. California lawmakers voted Thursday to boost the state’s minimum pay to $15 an hour over the next six or seven years, embracing arguments that it will raise millions of wage earners out of poverty. The 48-26 vote in the Assembly and the 26-12 vote in the Senate broke largely along partisan lines, with Democrats generally favoring the hike and Republicans opposing it. Gov. Jerry Brown, who earlier this week called the bill “careful and responsible,” said he will sign it into law Monday. In passionate floor debates, lawmakers on both sides harked back to an era decades ago when modest housing costs and low college tuition gave more Californians an opportunity to become educated, buy homes and rise to prosperity. A $15 minimum would help decrease the gap between wealthy corporations such as Wal-Mart and their low-wage employees, many of whom depend on food stamps and other government programs to make ends meet, supporters said. Opponents depicted the raise as too much, too fast, failing to account for regional differences and burdening small businesses already stifled by high taxes, workers’ compensation and strict regulations. The legislation sets California on a path toward the highest wage floor of any state in the nation, although others, including New York, are considering an equal amount. A national debate over income inequality has gathered force in recent years, turning into a central theme of the presidential campaign. Several large cities have adopted gradual increases to $15, including Seattle, San Francisco and Los Angeles. Under the California law, 5.6 million workers, or 37 percent of the workforce, would see their pay rise, according to a UC Berkeley study, not counting 800,000 affected by already-enacted local ordinances. Ninety-six percent of those benefited by the new bill are adults, not teens, and 37 percent have children. Only months ago, Brown had opposed a $15 level, given estimates that it would cost the state billions of dollars to boost its own workers’ pay. But he opted to push for a legislative compromise when a union-backed initiative qualified for the ballot last week. The legislation, SB 3, raises the current $10 minimum over six years for large and medium-size businesses and over seven years for businesses with 25 or fewer employees. After that, pay hikes would be pegged to inflation. The ballot initiative, sponsored by the United Health Care Workers West, part of the Service Employees International Union, has a quicker timetable, reaching $15 after only five years. It is expected to be withdrawn after Brown signs the new legislation. A ballot initiative cannot be amended once it is approved by voters. But in the case of legislative action, lawmakers will be able to backtrack in the future. In fact, SB 3 explicitly includes an “off-ramp” or “pause button.” Each year, on Sept. 1, a governor can halt the next year’s wage increase for a year if a budget deficit of more than 1 percent of annual revenue is forecast or if either job growth or retail sales drop. All of Orange County’s senators voted against the bill, with the exception of the group’s lone Democrat, Tony Mendoza, who represents Buena Park. All of Orange County’s Assembly members opposed the raise, including the delegation’s lone Democrat, Tom Daly of Anaheim. Along with Adam Gray of Merced, Daly was one of two Democrats to vote against the bill. Daly declined to comment after the floor vote. But in committee Wednesday, he explained he would have voted in favor of a $15 pay floor if the bill had not included an automatic cost-of-living provision. The county’s GOP lawmakers, however, opposed a $15 level regardless of the indexing provision. Sen. John Moorlach, R-Costa Mesa, said he already had heard from a local spa owner who has decided not to open a second location. “That’s 30 jobs,” Moorlach said. Wage inequality has grown in California since the 1970s, with pay for low- and middle-income workers dropping in real terms while the incomes of higher-paid employees have risen. Once achieved in 2022 – or for small-business workers in 2023 – the $15 level would boost the annual income of a full-time minimum wage earner to $31,200 from $20,800. In Orange County, where the cost of living is 46 percent higher than the national average, poverty is growing dramatically, along with homelessness and crowded housing, according to the Orange County Community Indicators Report, a survey by government agencies and charitable organizations. The California Poverty Measure, which accounts for local factors including housing prices, pegs Orange County’s poverty rate at 24.3 percent. A third of children under 12 live in poverty – a higher proportion than in the surrounding counties of Los Angeles, Riverside, San Bernardino and San Diego. “Housekeepers, bellmen, servers, dishwashers have to hold three jobs to make ends meet,” said Ada Briceno, secretary-treasurer of UniteHere Local 11, which represents 5000 Orange County hotel and restaurant workers. A plan to raise California’s minimum wage to $15 an hour by 2022 cleared the state Assembly Thursday in a 48-26 vote and was passed by the Senate just hours later. This vote puts the state on track to become the first in the nation to commit to such a large pay hike for the working poor. Assemblyman Roger Hernandez said it was time to stand up for California’s working poor. "So who will benefit from this proposal? Nearly 6 million California workers will receive a raise, which is over one-third of our workforce," Hernandez said. Opponents to the bill say raising the mandatory wage floor puts undue strain on businesses still trying to bounce back from a prolonged U.S. economic slump. All of the majority Democrats in the state Senate voted to pass the bill, which Senate President, Kevin de Leon, says came on a very special day. "Cesar Chavez would have been very, very proud if he were here today, and I know he’s watching us from above," de Leon said. "This is an investment in our human capital, in our future, and I’m extremely proud." On the Republican side of the house, Senator John Moorlach of Orange County says he and his colleagues could only watch as this bill was hustled through. Moorlach says it is not only going to hurt California businesses and the economy, and could even have an effect nationally, but that he is not buying Governor Jerry Brown’s claims this was an effort to prevent an initiative the governor says is more far-reaching. "He’s got a war chest," Moorlach said. "He could easily step up and say ‘I’m going to use my reserves to defeat your initiative’. He could have stood up to it, and instead he acquiesced, and he said, ‘Wait a second, you’re the guys who got me here, you helped me beat Meg Whitman and her $175 million. I owe you.’ And what does he care? He’s not going to be here in 2 years." If enacted, the bill would put California, the world’s eighth largest economy with roughly 10 percent of the U.S. population, in the vanguard of a growing number of U.S. states and cities that have moved in recent years to surpass the federal minimum wage, which has remained at $7.25 an hour since 2009. It was not long after the senate passed the bill that the governor’s office announced he will sign it at a ceremony in Los Angeles on Monday. It is a major victory for organized labor but a defeat for employers, especially small business owners. John Moorlach, R-Costa Mesa. "The credit for making history today belongs to the workers who spoke out and risked it all, the labor unions and community organizations who supported them, and elected leaders here in California who listened". Now for a few words from government analysts on the proposed minimum wage increase. "Retirement security" moves that will give cover to bloated public employee pensions. California’s Democratic leaders announced a “landmark deal” Monday to raise the minimum wage to $15 an hour by 2022. Yet it may be overshadowed by another milestone from the same day. Senate President Pro Tempore Kevin de León, D-Los Angeles, announced that his “Landmark Retirement Security Program” is moving to the next step in the legislative process. The minimum-wage boost surely will stifle the economy and exacerbate teen unemployment, but it could at least theoretically be undone. The quickly advancing new retirement program — similar to other programs floated in other states — means creating another state-run boondoggle that probably will never go away. In 2012, Gov. Jerry Brown signed into law a measure that creates the groundwork for the California Secure Choice Retirement Savings Plan — a new retirement-savings system for 6.8 million private-sector workers not offered such benefits by their employers. Legislation still is needed to put the specifics into place. Treasurer John Chiang said California is “set to herald in the most significant change to retirement savings since Social Security was enacted as part of President Franklin D. Roosevelt’s New Deal in the 1930s.” Be very afraid. Secure Choice boosters point to a genuine problem — half of Californians are on track to retire in dire straits. Private-sector workers generally have meager savings. But the plan not only misses the main point (the state’s tax-and-regulatory policy chases good jobs with benefits to Texas and Nevada), it also offers a “solution” that is astounding in its hypocrisy. This isn’t so much about helping private workers avoid poverty, but about keeping bloated public-sector pensions funded — while muting criticism of their excesses. “The program would require private employers with five or more employees not currently offering a retirement savings plan to provide their employees access to, and payroll deductions for, Secure Choice Retirement accounts,” according to a feasibility report issued March 17. Secure Choice will take 2 percent to 5 percent of their earnings. Workers would invest in IRAs they would own. Taxpayers are kept off the hook. The dollars would automatically be withdrawn, but workers could opt out of the program. “It’s nice that government’s concerned, but it’s not the government’s business,” said Sen. John Moorlach, an Orange County Republican and pension-reform expert. State officials certainly have moxie. As of 2014, California’s unfunded pension liabilities were $170 billion, according to a new study by Wayne Winegarden for the Pacific Research Institute. With additional risk taken into account, those numbers can soar to $600 billion, threatening to crowd out services and stifle economic growth. The same officials who refuse to rein in the pension debts they created presume to fix the pension problem for everyone else. The state predicts a 7.5-percent rate of return for its pension funds. The higher the predicted return-rate of these investments, of course, the richer the benefits public employees can receive and the lower the forecast level of debt. The state assumes an unrealistically healthy rate of return for its own employees, who receive defined-benefit plans, but private workers would receive defined-contribution investment funds that may be tied to low-return Treasury bonds. That inconsistency gives insight into what this is about: providing a few crumbs for private workers as a way to mute their criticism of the enormous pensions enjoyed by their masters. As I’ve reported, this idea was detailed in 2011 by then-Treasurer Bill Lockyer, a Democrat with close union ties. Five years ago, political pressure was building to reform the state’s overburdened pension system. Speaking to the Northern California Public Retirement Seminar, Lockyer noted that few private workers have a decent retirement plan while government employees can easily receive pensions that exceed what they earned on the job. In addition to its political benefits, Secure Choice also likely directs a large portion of the private-sector payroll to state pension officials, who often invest in ways that meet their pro-union political agenda. It gives them an enormous amount of money at their disposal. Secure Choice will impose costs and headaches on private companies, of course. It will crowd out private companies that are involved in this business. Many of these lower-paid employees are barely getting by, as it is, and would have to go through hurdles to opt out of the program if they don’t want to be part of it. If the state sticks to the original plan, it won’t offer much in the way of benefits. In his speech, Lockyer called 401(k) plans “an abject failure.” Yet that’s basically what’s being offered here, although with talk about turning it into an annuity at retirement. There’s always the other fear: Once a program is put in place, pressure will mount to expand it and begin offering more generous returns. The law forbids the use of taxpayer funds to backfill investments. But look back at previous pension-related promises. In 1999, the California Legislature rammed through S.B. 400, which set the stage for years of retroactive pension increases. The California Public Employees’ Retirement System (CalPERS) promised the massive benefit boosts would pay for themselves. Instead, the law imposed a crushing level of debt on state and local taxpayers. And who has to recount all the unfulfilled promises made by advocates for Social Security? Who expects today’s promises to be any better than past ones? California officials certainly don’t understand basic economics, which might explain their minimum-wage foolishness. But they probably know what they are doing with this Secure Choice program, which is to create a program that’s more about the “political sustainability” of outsized public-sector pensions than about helping private workers.